Humax HD-FOX T2 review | What Hi-Fi? This was the first Freeview HD box to market, and snaffled a five-star rating on its very first outing. Part of the appeal is that, unlike the other units whose USB and ethernet inputs currently lie dormant, this Humax is already DLNA compatible, meaning you can stream media files (including DivX Xvid, MPEG and JPEGs) from a PC or networked storage device through the box's ethernet socket. You can also plug USB storage into the relevant socket and play media files (DivX, Xvid, MP3 and JPEGs). We're hoping that later in the year you'll also be able to enjoy online streaming sevices such as BBC's iPlayer but, in the meantime, the Humax is currently compatible with Sky Player. You wouldn't describe this set-top box as drop-dead gorgeous but, for the money, the glossy black fascia and green numerical display are as enticing as you'd expect, although we wouldn't say no to an alphanumeric display to show the current channel. Compared with some remotes that come with rival boxes, the Humax wand is a serious luxury. Not only are buttons thoughtfully positioned and very responsive, it's also a learning remote that allows you to operate two additional devices. If you wish, you can output broadcast signals in their native form or you can attempt to use the Humax's built-in scaler to output everything at 1080p. But we found that the scalers in our reference Sony and Pioneer TVs did a much better job. In the main, picture quality is excellent. Both high-definition and standard-definition images are sharply drawn and fast movement is well handled, with minimal judder. The lack of digital noise is extremely welcome as is the natural colour balance. What's more, the Humax proves to be a dynamic, detailed, rhythmic listen. It's a tad brighter than more subdued-sounding boxes but it isn't especially distracting. 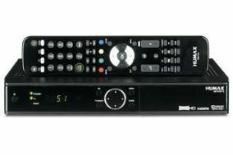 One thing to note: like quite a few of the current Freeview HD boxes, it won't transcode the multichannel AAC sound on BBC Freeview HD broadcasts to Dolby Digital 5.1, so you'll only get stereo sound if you hook it up via the optical digital connection to your home cinema amp. Humax says a fix is in the pipeline for this (more details here). Neverhteless, this is still is an excellent buy: if you live in the right reception area for Freeview HD, we'd go so far as to say that it's a no-brainer.